First of all, we would like to thank participants of our contest. Today it is much more than just a competition. When participating you do a little research and also creative work and help millions of aquarists around the world to obtain important information about the natural habitat of freshwater aquatic animals, to be inspired by the beauty of biotope aquaria and to draw public attention to environmental problems. In 2016, aquarists from 25 countries took part in our contest and we hope very much that the love for biotope aquarium and nature will spread even further. Together we are going a very important way! Any interested person can become a participant of the contest, regardless of citizenship, nationality and place of residence. The contest rules are the same for everyone. 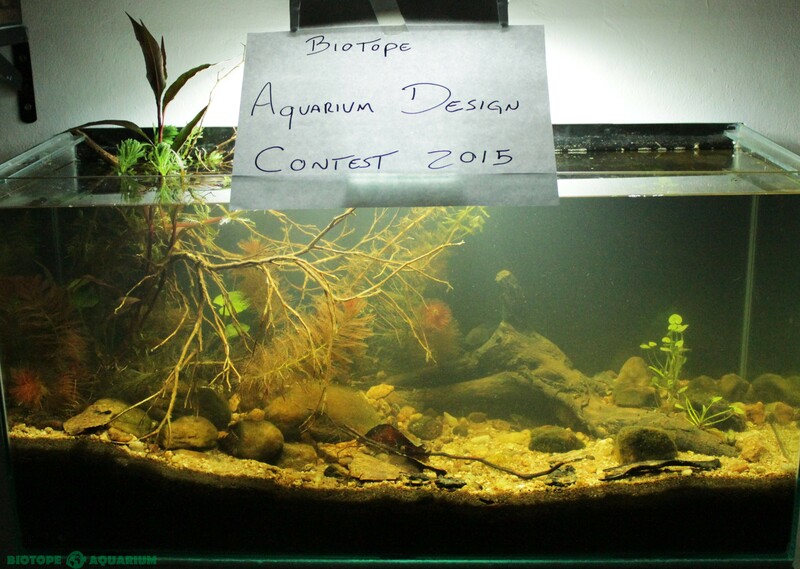 Each participant has the opportunity to submit to the contest up to five biotope aquaria. Only freshwater aquaria are accepted. September 1st to 30th. We accept entries and necessary information about aquaria from participants. October 1st to 10th. We process data and publish information on our website. It is the last opportunity to correct mistakes the organizers can point out. October 11th to 20th. The organizers will evaluate the entries according to the criteria 4, 5, 6. October 21st to 30th. The members of the jury will evaluate the entries according to the criteria 1, 2, 3. November 1st to 10th. We process points and comments by the members of the jury. November 11th to 20th. Preparation and sending of certificates to authors of 50 best entries. November 21st to 30th. Preparation of an aquarium catalogue 2017 for printing and sending to the authors of the 10 best entries and to the jury members. December 1 st. The results of the contest will be published officially on our website. February 10th to 11th. Awardinf ceremony for participants of the contest at the Biotope Aquarium Conference in St. Petersburg. Participation is not necessary. Dear participants! Every year we try to optimize the rules of the contest, to make it even more interesting for the audience. At the same time, we try to make sure that you understand how you can get the maximum points. Please read the rules for completing the application, as well as the evaluation criteria for biotope aquaria. Please note! The more complete and accurate information you provide, the more points you will receive. Data not confirmed by references to reliable information sources will not be taken into account! A correctly formed title should include: the visual characteristics of the biotope (1), the type and, if available, the name of the reservoir / watercourse (2), the toponym indicating the exact location of the biotope (3), the name of the country, where the biotope is located (4). Example: Wetland (1) creek (2) near the mouth of the Yangtze River (3) in Hunan Province, China (4). Visual characteristics of the underwater landscape: depth, relief, appearance of soil, stones, driftwood. If you have the exact coordinates of the biotope, specify them please. Physical and chemical parameters of the environment: light, color, transparency, temperature, hardness, acidity of water. List of aquatic organisms living in the specified biotope (including those used in your aquarium): reptiles, amphibians, fish, plants, crustaceans. Description of the environment surrounding the biotope and factors that significantly affect the ecosystem. For example, branches of trees hanging over the water, etc. Environmental aspects. They are taken into account when choosing the winner in the ECO Trophy category. If the biotope you have recreated is in danger, be sure to tell about it in your application form. All the information specified in the description of the biotope should be confirmed by references to reliable sources of information. For example, photos, videos, articles, blogs, entries in social networks. If you have used books, magazines, be sure to include the title of the publication, the author, and the chapter in which the information was found. To evaluate the correspondence to the biotope and the viability of the system, we need a little information about your aquarium. The volume and dimensions of your aquarium in liters and centimeters. A complete list of aquatic animals living in your aquarium in Latin: fish, plants and large invertebrates. Technical equipment of your aquarium: filtration, flow, lighting. Decorations and grounds used: type, particle size, origin. Water parameters: temperature, color, GH, KH, pH. Interesting facts about your aquarium. Surely your aquarium has some special features. Tell about the most interesting ones, and also explain the controversial nuances that may affect your points. The photo should be clear and not too light. The aquarium glasses should be clean. There should be no reflections on them. The equipment should be hidden or removed when taking photo. All listed aquatic animals should be visible in your photos. And "aliens" should not be visible. The fishes should be located nicely and naturally. For example, they should form a beautiful school. A participant should take video of his aquarium. This year it is necessarily. Voice comments and other features that can reveal authorship are not allowed. Your video will be posted on the contest channel on YouTube. Posting of your video in other websites and social networks before the announcement of the results of the contest is not allowed! We accept only photos of aquaria existing at the time of submitting application. To confirm your authorship please upload to your contest form a photo of your aquarium with a sheet of paper with "Biotope Aquarium Design Contest 2017" written on it. This photo is only for the organizers of the contest and will not be published. We also ask participants to send photos of aquaria not submitted to other competitions.